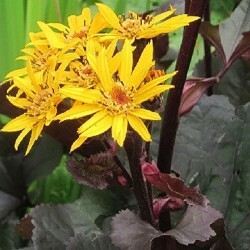 Ligularia There are 2 products. New. The remarkable high perennial foliage (void) heart-shaped ring, purple black - dark chocolate. Rapid growth. Large orange yellow daisies. Deau edges or massive expenses. Heavy soil, wet, clay, rich and deep. 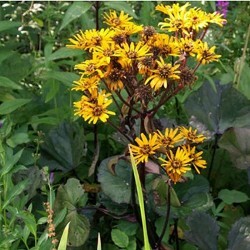 Perennial imposing erected interesting by its summer flowering: big yellow orange daisies and its large leaves (deciduous) purple heart-shaped bronze that form beautiful round tufts basin edge or in partial shade. Sol fees.